At Parent to Parent Family Support Network™-High Country (FSN-HC), we believe all children have abilities and gifts to give. 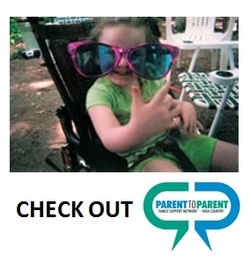 Parent to Parent FSN-HC provides free support, caring connections, information and hope to families who have a premature baby, a child with a disability, an emotional or behavioral challenge, a mental illness, a chronic health condition or to families who are grieving the death of a child. We provide information to help families see the possibilities for their children, and tools so that they can turn that potential into reality. Provide information for families and service providers on disabilities and health conditions. Match families one-to-one with a trained, volunteer family for emotional support and information. Connect families to resources, lending libraries and legislative information. Sponsor free community workshops for families and service providers. Provide newsletters, a website and a toll-free family phone number. Promote collaboration among families and service provider.